… but it is very much appropriate here! Why is it that whenever there is a hot button issue that seems to fall under the rubric as counter to the “public good” or “public health”, an immediate response is to “ban” the substance or the activity in question. Here in Ottawa, smoking has effectively been banned almost everywhere except for your own home. This was the end result of a concerted campaign by Ottawa public health to convince Ottawa Council that smoking – anywhere where non-smokers could be exposed to the evil fumes – should be banned from any place where the City has authority to do so. This in spite of the fact that data show the rate of smoking on the decline and it had been so for several years. I am not a Libertarian but sometimes I can see where they are coming from. Does an otherwise legal activity need to be banned in order to meet some defined goal for the public good? Why not try education programs first? It obviously worked for smoking. Rates were declining before the ban. So what’s next? Milkshakes? Chips? Poutine? Popsicles? 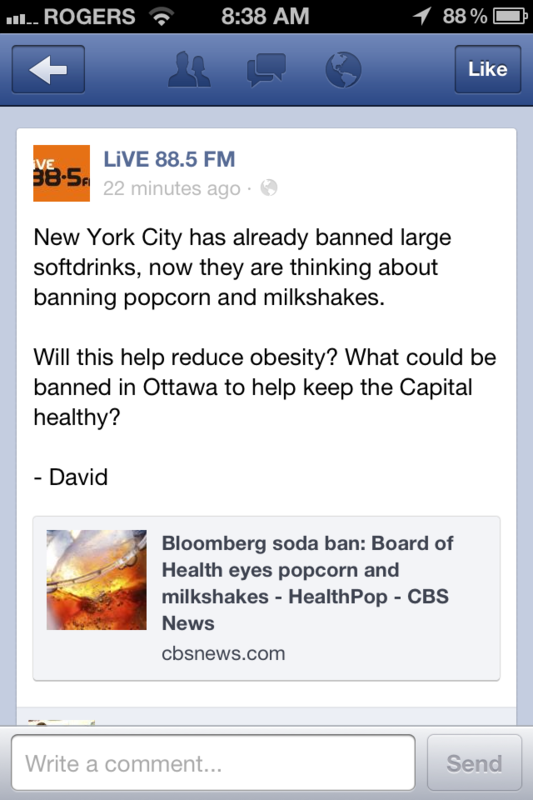 How about legislating exercise? Make Net-linked pedometers mandatory and fine or deny medical assistance to those who don’t burn a prescribed number of calories per day? We often do. Just in a roundabout way, sometimes!